Microtubules are highly dynamic assemblies of the protein tubulin. Their dynamic behaviour is crucial to mitosis, the process of chromosomal division to form new cells. Microtubule dynamics are highly regulated during the cell cycle by endogenous cellular regulators. In addition, many antimitotic drugs and natural compounds alter the polymerisation dynamics of microtubules, blocking mitosis, and consequently, inducing cell death by apoptosis . The drugs bind to diverse sites on tubulin and at different positions within the microtubule, and they have diverse effects on microtubule dynamics. However, by their common mechanism of suppression microtubule dynamics, they all block mitosis at the metaphase/anaphase transition, and induce cell death. After treatment with different anti-tubulin drugs, it was also demonstrated that apoptosis occurs either in the interphase or in mitosis depending on the cell type and experimental conditions [2, 3]. The relationship between cell cycle disturbance due to the use of these agents and apoptosis is poorly understood. Insight into the binding and mode of action of most of antimitotic drugs have been obtained by the identification and mapping of mutation in appropriate resistant lines. Unfortunately, up to now there is no strong evidence about mode of action N-phenyl carbamates, effective anti-mitotic herbicides. Although, recently it was shown that phenylcarbamates and benzimidazoles, can compete for the site(s) of binding on β-tubulin. Benzimidazoles interact very specifically with different eukaryotic β-tubulin and resistance to these anti-microtubule drugs may be caused by point mutations in β-tubulin which replace Glu-198 with either Ala, Asp, Gln, Lys, Val, or Gly, or which replace Phe-200 with Tyr . As it was found amino acid substitutions in position 198 of fungal β-tubulin, lead to negative cross-resistance to phenylcarbamates, but changes Phe from Leu-250, Val from Ala-165, and Ala from Thr-237 are responsible for phenylcarbamate cross-ressistance . To clarify the sensitive/resistance of isopropyl-N-phenylcarbamate (IPC) resistant N. sylvestris mutants  to benzimidazole the influence of different concentration of nocodazole and its diverse effects on microtubule dynamics and cell cycle progression were studied. Two different apoptotic responses and patterns in control and mutant lines were found after nocodazole treatments. Nocodazole (Sigma) was dissolved in dimethylsulfoxide (DMSO) and stored at -20°C. The final DMSO concentration during nocodazole treatments did not exceed 0.5%. Only 0.5% DMSO was added to control samples. The root cells of control and IPC-resistant mutant N. sylvestris lines were exposured with nocodazole at various concentrations (0.01, 0.1, 1, 10, 100, and 500 MkM) for 24 h, and then fixed in an ethanol/acetic acid mixture (3:1) for 12 h. For chromosome counting and classification of mitotic figures, slides, were stained with acetoorcein (1% solution in 45% acetic acid) for 24 h and examined. Cell were counted and analysed at magnification of 1000X on Carl Zeiss light microscope. In both control and IPC-resistant N. sylvestris lines various nocodazole concentration treatments led not only to increase the mitotic indexes from about 7% to ~12–13%, but also resulted in an appearance of mitotic figure disturbances during different phases of mitotic division (see Table 1 and Table 2). No any disturbances were found in prophases of IPC-resistant plants after drug effects, whereas nocodazole in concentration from 10 to 500 MkM revealed them in control plant cells on dose-depended manner (Table 1). It was found that metaphases of both lines were more sensitive to nocodazole treatments, but nevertheless the per cent of disturbances in metaphases, anaphases and telophases was about in two-three times more in control line as compare to mutant one (see Table 1 and 2). NZ = nocodazole, MI = mitotic index, % of disturbances in each mitotic phase was calculated as % from total number of dividing cells. It was found also that different nocodazole concentrations rapidly induced apoptotic processes in both control and mutant lines, but cell responses after nocodazole treatments were completely different. Even low concentration of nocodazole (0.1–10 MkM) induced nuclear DNA damage: chromatin recondensation and DNA fragmentation in prophases, metaphases and anaphases of control plant cells (see Figure 1). Whereas high level of nocodazole (100–500 MkM) induced total DNA fragmentation on all stages of cell cycle including interphase. 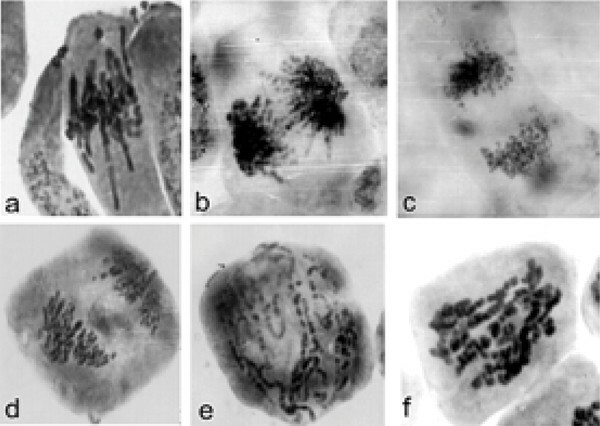 Mitotic figures in sensitive N. sylvestris lines after treatment of nocodazole in various concentrations: (a) 0.1 MkM nocodazole treatment; (b-c) 1 MkM nocodazole treatment; (d-f) 10 MkM nocodazole treatment. Bar: 1 cm = 1000 mm. At concentration of 0.1 MkM nocodazole effected significantly metaphases only in IPC-resistant plant cells. 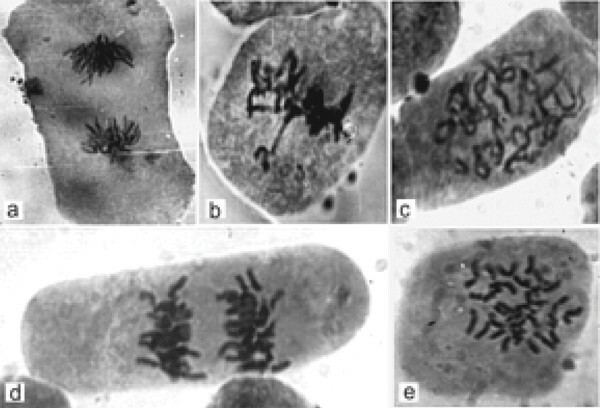 It was found that in the cells of mutant lines treatment of low nocodazole level (0.1–1 MkM) resulted in chromosome delay during chromosome segregation in metaphase, 10 MkM nocodazole treatment induced an appearance of C-mitosis, chromosome delay and chromosome-bridges formation in different phases of mitosis (Figure 2). Mitotic figures in IPC-resistant N. sylvestris lines after treatment of nocodazole in various concentrations: (a-b) 1 MkM nocodazole treatment; (c-d) 10 MkM nocodazole treatment; (e) 100 MkM nocodazole treatment. Bar: 1 cm = 1000 mm. High levels of nocodazole (100–500 MkM) resulted in dramatic alterations in the cells – C-mitosis, aberrant spindle formation with consequent more frequent anomalous situations (for example, multipolar mitoses, and as a result of this, an appearance of star anaphases). No any DNA fragmentation was observed in IPC-resistant lines after any concentration of nocodazole treatment. It is well known that treatment of cells with nocodazole and other microtubule-interfering agents evokes the activation of stress response pathways, cell cycle arrest, and the induction of apoptosis. Early, nocodazole was frequently used to examine the role of microtubules in vesicle transport , to induction of polyploidy , aneuploidy , and certainly to study an apoptosis in different cells [8–13]. Very often nocodazole effects result in DNA fragmentation, one hallmark of apoptosis. In our data nocodazole treatments revealed DNA fragmentation in control, sensitive to IPC, N. sylvestris line only. It was not found any DNA fragmentation in mutant plan cells after nocodazole exposure. Nevertheless, cell death was observed in both lines. We established that nocodazole increased the mitotic index in both lines but it also enhanced an apoptotic response. These results are coincided with data obtained early on animal cells . We also found that IPC-resistant N. sylvestris mutant cells possessed less sensitivity to nocodazole treatments that control N. sylvestris plant since it was established that the per cents of disturbances in metaphases, anaphases and telophases were about in two-three times more in N. sylvestris control line as compare with mutant one. Microtubules in prophase of mutant plant cells were resistant to all used nocodazole concentrations. As it was shown there were no disturbances on this stage of mitosis in IPC-resistant plants. However, all revealed disturbances in metaphase, anaphase and telophase, in mutant testify about cell suicide program after this drug effect. Thus, we can summarize that IPC-resistant plant cells are more resistant to nocodazole than that of control line. Nocodazole in concentration from 0.1 to 500 MkM evokes clear apoptosis in control N. sylvestris plant cells characterizing in mitotic arrests and DNA fragmentation. It provokes also cell death process in IPC-resistant cells, but on another distinct way of cell degradation. It is possible to conclude that the same nocodazole treatments could induce, in two different plant lines, cytostatic effects followed by probably two different patterns of plant death. Recently, two different patterns of cell death were also found on two different cell animal lines after same antimicrotubular drug effects . It has already been reported early that nocodazole possesses pleiotropic effects that are independent of microtubules , or probably different apoptotic responses depend from cell types as it was indicated by us above. It is possible to presume that the higher apoptotic rate in control plant cells after nocodazole treatments may be also a consequence of absence mutant microtubule protein(s) or mutant microtubule associated protein(s) which confer(s) resistance to IPC in N. sylvestris mutant lines. Experiments on nocodazole effects on cells of model plant lines are continuing now.